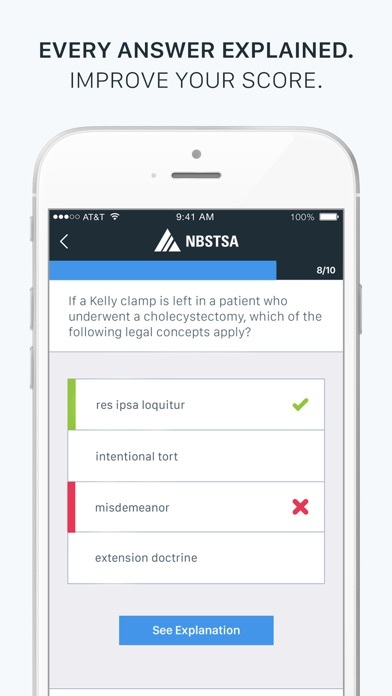 NBSTSA's Certified Surgical Technologist app is a powerful examination simulator that allows you to create customized practice tests with detailed answer explanations for every question. 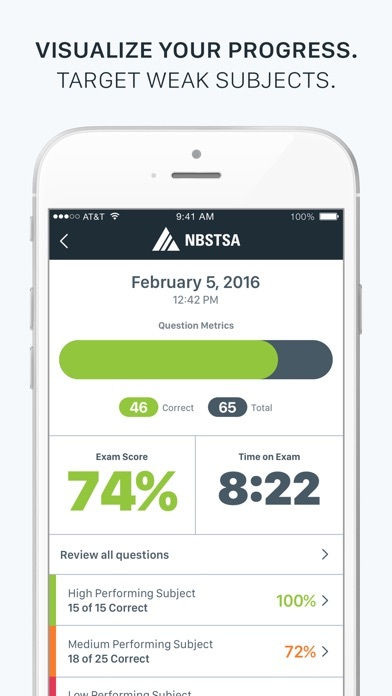 View your results and examination history with just a few taps. Study anywhere at any time without Internet. The app utilizes the “spacing effect” to enhance your learning capability. You’ll space out your studying into shorter, more productive study sessions, which allow your brain to retain more information. 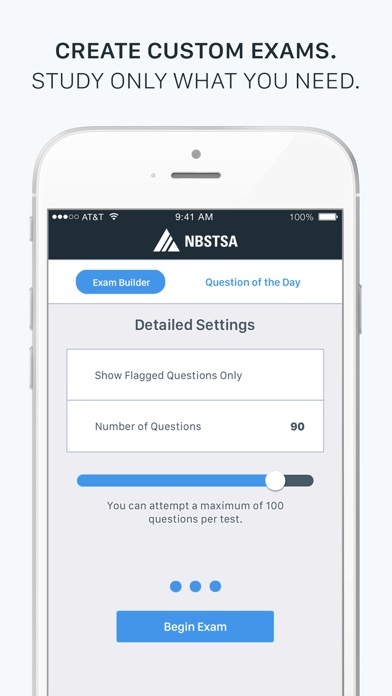 Simply tell the app how many questions you want to take, enable the timer, and filter examination content to create the perfect study experience. 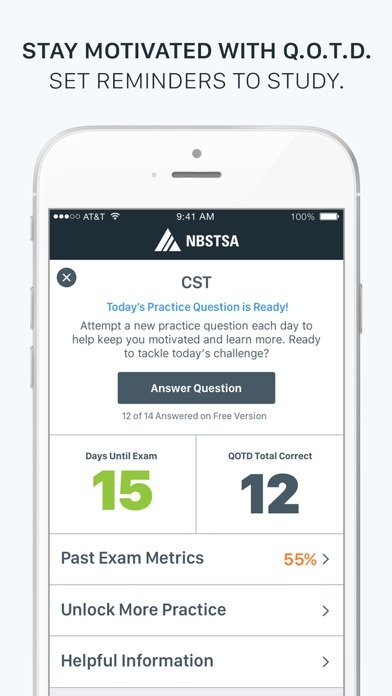 POCKET PREP KEY FEATURES: • Two practice modes: simulation and study • Automatic test saving and retrieval • Detailed history and results reporting • Intuitive navigation • Question of the Day access • Study reminders • Exam day countdown The questions in this examination prep app were created by the NBSTSA and incorporate the same stringent and secure practices used to create the CST examination. Questions were written and reviewed by subject matter experts utilizing the CST Content Outline to ensure that only the highest quality questions are published to best prepare candidates for their CST examination. FREE WITH DOWNLOAD: √ 10 practice questions and rationales √ New "Question of the Day" each day √ CST examination information FULL PAID VERSION: + 335 total practice questions + Detailed answer explanations + References to source materials + Exam creation customization + Priority email support CST SUBJECT AREAS: 1) Administrative & Personnel 2) Anatomy & Physiology 3) Equip Sterilization Maintenance 4) Intra-Operative Procedures 5) Microbiology 6) Post-Operative Procedures 7) Pre-Operative Preparation 8) Surgical Pharmacology The NBSTSA recommends using this mobile app in conjunction with other study products available on www.nbstsa.org for a comprehensive examination preparation approach. Great app to help you study. Its has questions from the CST exam. I studied through the app and knew every right and wrong answer like the back of my hand. I took the exam today, and not one single question from the app was even close to the ones given on the exam. It didn’t help me at all. The NBSTSA is a money racket if association to begin with and this app is nothing but false hope and information. Don’t waste you’re money people!!! 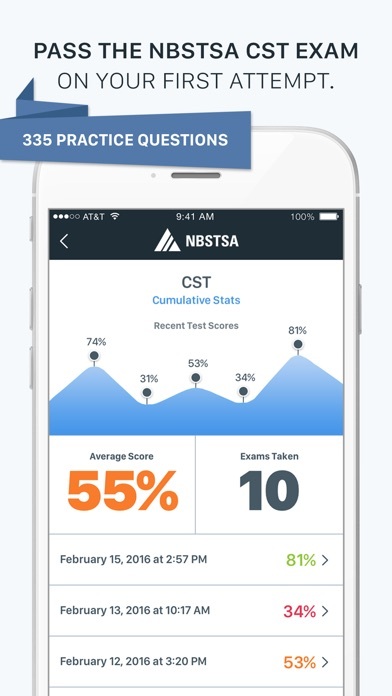 I spent countless hours studying on the app and felt well prepared for the CST exam. Then when it came time to take the exam NONE of the questions were actually on the exam. I wouldn’t recommend this app as a study tool. You’ll waste your time and definitely waste your money. Just submitted my renewal application. I’m hoping this will prep me.